Lives of the Saints – International hardship duty in Chad. 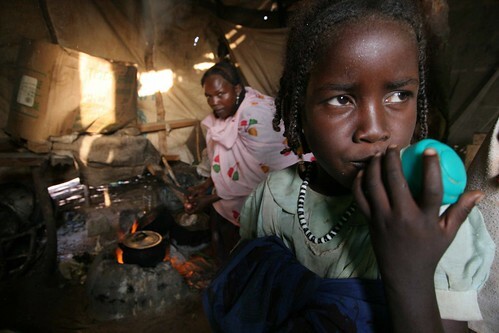 Bredjing, a refugee camp in eastern Chad, close to the border with the Darfur region of Sudan. Twelve camps in the region house a quarter of a million Sudanese who have fled to the area and are now caught between warring armies. Photograph by Christoph Bangert. Just about every organization has now managed to post an update regarding their activities in Georgia. Over the weekend the International Rescue Committee (IRC), Catholic Relief Services (CRS), Save The Children (SAVE), CARE, United Nations High Commision on Refugees (UNHCR) and the International Committee of the Red Cross (ICRC) have all issued statements. Some organizations were on the ground prior to the recent hostilities and they have now stepped up operations to handle the increasing flow of civilians streaming out of the conflict zone. Other organziations are sending in teams to assess the situation. Coordination meetings are already being held in the Georgian capital of Tibilisi and rumor has it organzations have begun submitting their proposals to the U.S. Office of Foreign Disaster Assistance (OFDA) for funding. For those of you forgot what the field looks like, and for those of you have never seen it, there is a great UNHCR photostream over on Flickr. Click the pic or HERE to be taken there.